UN: Afghanistan peace a necessity Jump to media player Head of the United Nations Assistance Mission in Afghanistan Nicholas Haysom has said that the UN stands ready to help the country find a lasting political settlement. New Afghan president to take office Jump to media player Afghanistan's new government takes office on Monday, almost six months after the country's election process began. 2001: Karzai's hopes for Afghanistan Jump to media player In December 2001 Hamid Karzai spoke to Lyse Doucet in Kabul after he was named as Afghanistan's interim leader. Women 'at risk in Afghanistan' Jump to media player Equality for Peace and Democracy's Hossai Wardak worries that international donors will pull out after the US military withdraws from Afghanistan - and women will pay the price. 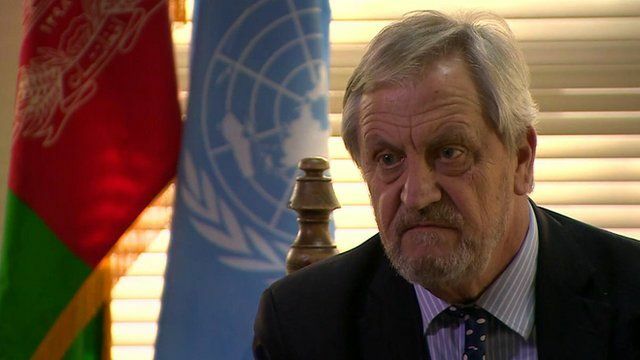 Head of the United Nations Assistance Mission in Afghanistan Nicholas Haysom has said that the UN stands ready to help the country find a lasting political settlement. Although the Taliban have stepped up their attacks, the stated aim of the country's new president is political engagement with the insurgents. BBC World Affairs correspondent Mike Wooldridge asked Mr Haysom if he was playing a brokering role.